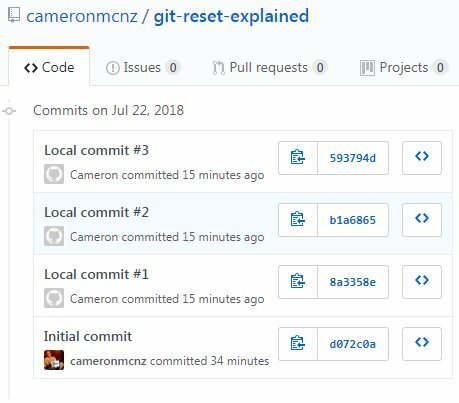 I published an article recently on how to perform a hard git reset, but one of the questions that I was repeatedly asked on social media was what happens after you do a hard git reset on local commits and then publish the changes to your remote GitHub or GitLab repository? When you do a git reset and push, does the entire commit history get published, including the commits that happened subsequent to the reset point, or are the commits that Git rolled back ignored? When working locally, it’s not exactly clear what happens when you git reset to a previous commit and push those commits to a remote repository. 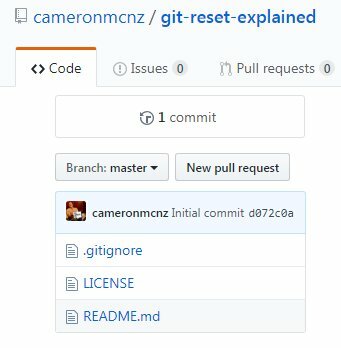 So to demonstrate exactly what happens when you git reset and push, I’m first going to create an empty, remote GitHub repository named git-reset-explained. It will contain nothing but a readme.md file, an MIT licence, a .gitignore file and a single commit. Remote repository for git reset and push. With the remote GitHub repository created, I will locally clone the repo and begin working inside of it. From within the cloned repo, I will create five new files, adding a new commit each time. $ git add . & git commit -m "Local commit #1"
$ git add . & git commit -m "Local commit #2"
$ git add . & git commit -m "Local commit #3"
$ git add . & git commit -m "Local commit #4"
$ git add . & git commit -m "Local commit #5"
Now if I was to perform a hard git reset and shift HEAD to the third local commit, commits 4 and 5 should disappear, right? The git reset should remove those commits from my commit history and take me right back to the reset point, right? Let’s see what actually happens when we issue the command to git reset local commits. As you can see from the git reflog command, commits 014df6a and 6237772 are still hanging around. When you git reset local commits, those commits don’t disappear. After the push, when we look at the commit history on GitHub, we notice there are only four commits, the server-side commit that created the GitHub repository, and the three local commits that we published. When the git reset and push happened, the fourth and fifth local commits were not pushed to the server, essentially deleting any history of them ever existing. Result of a git reset hard and remote push. So what did we learn? Well, that when we git reset to a previous commit and push to a remote repository, no trace of the undone commits are published. That’s in stark contrast to a git revert in which the revert command itself creates a new commit, and none of the past commit history is lost. So if you ever want to undo a previous commit with Git, reset is the right Git command to use, not revert. Want to learn more about Git? Are you new to Git and interested in learning more about distributed version control? Here are some Git tutorials and Jenkins-Git integration examples designed to help you quickly learn Git, DVCS and other popular DevOps tools such as Jenkins and Maven.